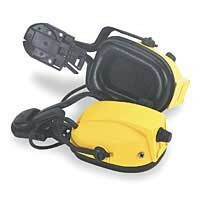 The Bilsom Impact 708 Electronic Helmet Mount Earmuff will amplify sounds and filter harmful noise. The noise protection amplifies sound for natural hearing and limits it to a safe level. The system has an automatic shut-off and an AUX signal input.